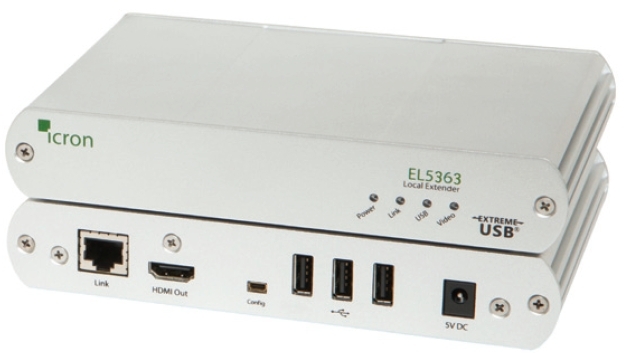 The EL5363 KVM Extender System features the latest and most robust HD video and USB extension technology from Icron Technologies. The EL5363 extends both HDMI and USB 2.0 up to 100m using a single Cat 5e/6/7 cable. The EL5363 KVM Extender lets you place an HDMI host up to 100 meters (330 feet) away from the viewing area using a single Cat 5e/6/7 cable. The system supports full HD video and USB 2.0, providing the ability to control keyboards, mice, flash drives, audio peripherals and other USB 2.0 and 1.1 devices.